Toast to a new life together with our Credit Card Shaped Personalized Bottle Opener. It's a thoughtful favor your guests will enjoy using each time they're ready to enjoy a cold one. The unique style bottle opener is available in black or white. Choose from our wide variety of design to perfectly match your theme of the day! Minimum of 36 required for purchase. Would it be possible for you to send me one to look at? I'm sorry a sample is not available for this Credit Card Shaped Personalized Bottle Opener. Hi, on the preview screen for designs it says to copy the text but where does it need to be pasted if we fill out all the fields in the personalize section? Hi, you need to use the designer tool in the shopping cart and it will automatically fill out the missing information without the need of copying and pasting it. Please can my name and Husband's be personalized on the credit card bottle openers? Yes, you can add your names on this Credit Card Shaped Personalized Bottle Opener. After adding it to your cart, you will see a personalize now tab where you add the text. You can add 3 text lines (each not exceeding 15 characters). Can I get a sample of the credit card bottle opener? I'm sorry, we don't have a sample option available for that item. A minimum quantity of 36 is required for the Credit Card Shaped Personalized Bottle Opener. Is there an artwork set up charge for the credit card bottle openers - even if I'm going with one of the designs listed? Yes, the artwork set up fee does apply anytime we screen-print and the price is listed on the product page. Is the color the color for the bottle opener or the design? and you can add 2 text lines max of 20 characters when you personalize this Credit Card Shaped Personalized Bottle Opener. Will you receive a sample proof prior to printing these or is the personalization image I see when checking out the only thing I see prior to receiving? The preview shown when placing your order for the Credit Card Shaped Personalized Bottle Opener is the only "proof" that is provided. How do I see what my product will look like? Also I'm not sure if I'm choosing black for the opener and white for the print or vice versa. 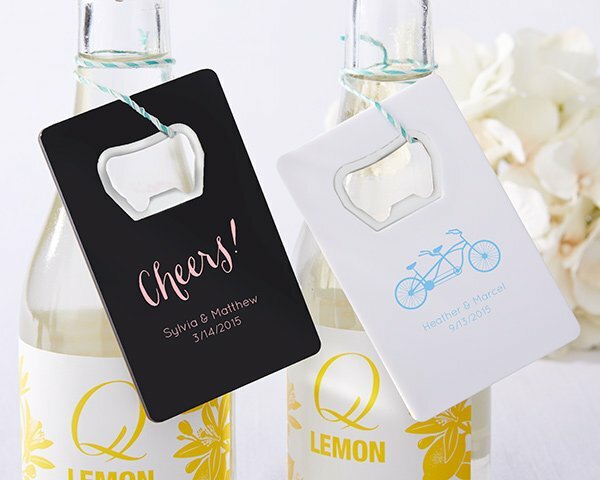 You will be able to select either white or black color after adding the Credit Card Shaped Personalized Bottle Opener in your cart under personalization. You also need to click on personalize now tab to design it and see how it looks like. What is the "max" engraving I can do for this credti card bottle opener? I would like to put a "quote" on it along with the bride and grooms names. Thanks for your inquiry! It actually depends on the design you choose as to how many characters are allowed for each line of text. You can check the preview tool and you can then choose a design and try to fit the quote. You'll see that option after adding the Credit Card Shaped Personalized Bottle Opener in your shopping cart. Hello i just wanted to know if the Credit Card Bottle opener prints on the actual bottle opener or is the personalization on a sticker? Great question. That favor is super nice because it’s printed RIGHT on the credit card opener. You might also want to watch this video. Could I get a sample of item # KA-29355, Credit Card Shaped Personalized Bottle Opener? I'm sorry, that item is not offered/sold as a sample. You may want to read the reviews, though. They're located directly below the description. What color does these bottle openers come in? And is the font a different color? For example the black bottle opener would have what color font? The Credit Card Shaped Personalized Bottle Opener is available in black or white and you can select your own font color. You have an option to choose from the choices we have under personalization after adding it to your cart. 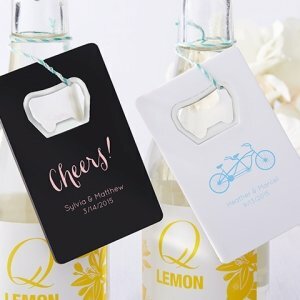 Are the credit card shaped personalized bottle openers in black engraved? The personalization for the Credit Card Shaped Personalized Bottle Opener is not engraved, it's a sticker. You can choose from our wide variety of design and color to perfectly match your theme. Please also note that there's an Artwork Setup Charge of $40.00.